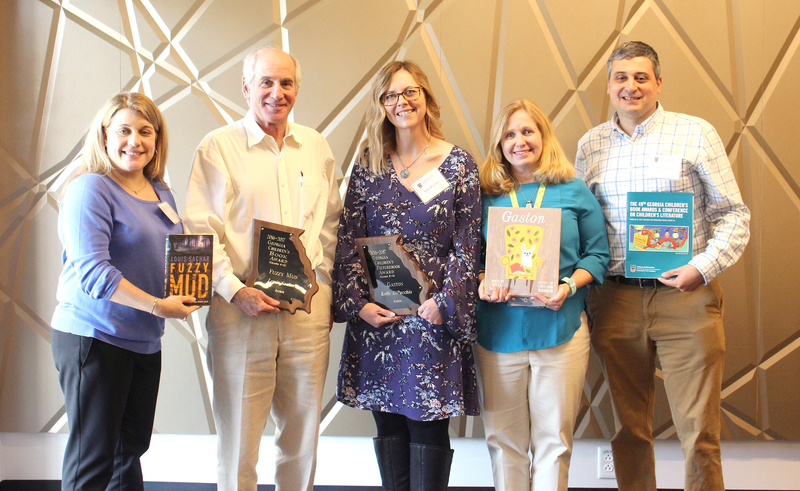 Winners of the 2017 Georgia Children’s Book Awards, Louis Sachar (“Fuzzy Mud”) and Kelly DiPucchio (“Gaston”) received their plaques during a ceremony Friday at the Georgia Hotel and Conference Center. The annual awards also announced the winners for 2018: “Projekt 1065” by Alan Gratz and “It Came in the Mail” by Ben Clanton. Pictured, from left, are Sara Kajder, clinical associate professor and chair of the book (grades 4-8) nominating committee; Sachar; DiPucchio; Jennifer Graff, associate professor and chair of the picturebook (grades K-4) nominating committee; and Petros Panaou, clinical associate professor and chair of the Georgia Conference on Children’s Literature, which hosts the awards. More than 30,000 children across the state took part in this year's vote. Books about a magical mailbox and a secret Nazi mission topped the list of children’s book favorites at the 2018 Georgia Children’s Book Awards. This year’s winning books, “It Came in the Mail” by Ben Clanton and “Projekt 1065” by Alan Gratz, received the most votes from children across Georgia and were officially announced during a ceremony at the University of Georgia Center for Continuing Education & Hotel. “It Came in the Mail” won in the Picturebook (grades K-4) category while “Projekt 1065” won in the Book (grades 4-8) category. The winners were selected from among 20 nominees in each category, with 31,813 children casting votes for their favorites at 155 schools and libraries across the state. The Georgia Children’s Book Awards take place each year and is part of the Conference on Children’s Literature, hosted by the UGA College of Education. Among younger children, “It Came in the Mail” reinforces the importance of humor in books for young children, said Jennifer Graff, associate professor in the College of Education’s department of language and literacy education. Graff chairs the picturebook (K-4) nominating committee. In the book, a magical mailbox fulfills a young boy’s wishes for mail tenfold. After being inundated by surprising and comical “gifts” (such as a whale with wings, a dragon or a pirate pig), the boy decides to send his gifts to other children. “It’s a very entertaining book, and it just goes to show that when kids are selecting their favorite books, humor, especially when partnered with kindness, is paramount,” said Graff. 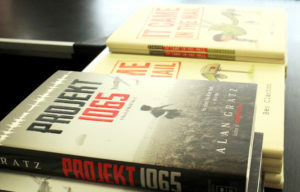 The 2018 winners of the Georgia Children’s Book Awards were “Projekt 1065” by Alan Gratz and “It Came in the Mail” by Ben Clanton. 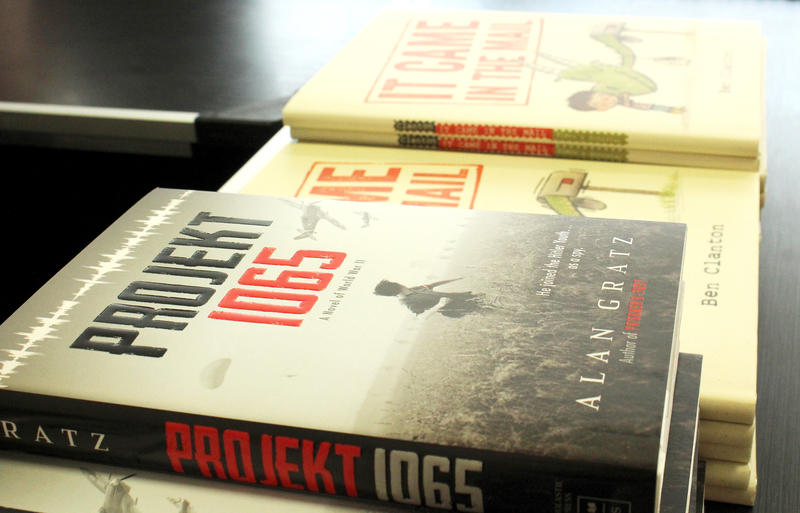 For older readers, Gratz’s “Projekt 1065” takes place during World War II when a boy whose parents are spies joins a Hitler Youth group in order to access plans for a new plane that could change the course of the war. Along the way the main character has to make difficult decisions and separate truth from propaganda, said Sara Kajder, chair of the book (grades 4-8) nominating committee and clinical associate professor in the department of language and literacy education. Winning books for older readers, she said, allow kids to see themselves as someone who can make a difference. Assembling the list of nominated books began nearly two years ago, starting with a six-month public nomination period. Then, committees comprising educators, media specialists and librarians select 20 nominees and share the lists across Georgia. Schools and libraries have a year to introduce the books to children, and then students, through their school or public library, vote for their favorite. Voting took place January through early March. Graff emphasized that although there is only one winner selected from each list, often the competition is fierce and all of the books resonate with children. For example, 416 votes separated the winning picturebook from the second-place finisher. For older grades, Gratz’s book won by just 143 votes.